In order to further enhance suitability for the specific requirements of operators in the construction sector, DAF Trucks is expanding its range to include a number of new vehicle configurations, including an 8×4 ‘tridem’ rigid with double-drive tandem and steered trailing rear axle. DAF is also introducing a 10-tonne front axle, and a completely new 7.5-tonne non-steered trailing axle. The new developments underline DAF’s ambition to expand its presence in vocational segment — particularly in the construction sector. 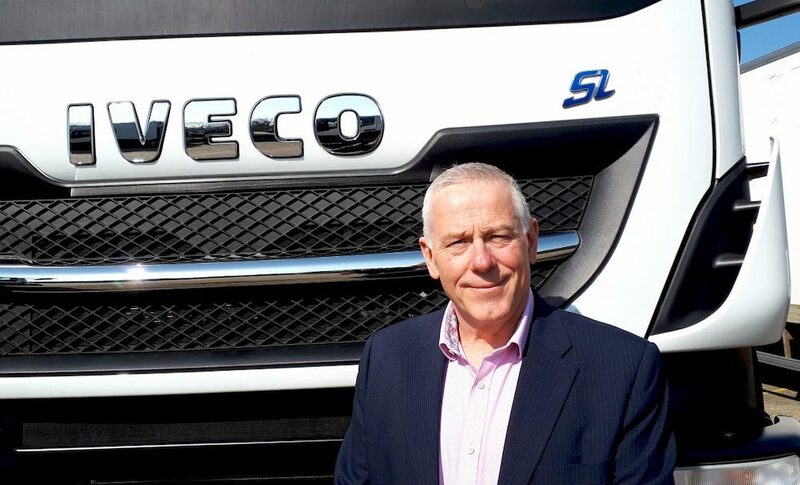 “2018 was an historic year for DAF”, says Richard Zink, Director of Marketing and Sales and member of the Board of Management at DAF Trucks. 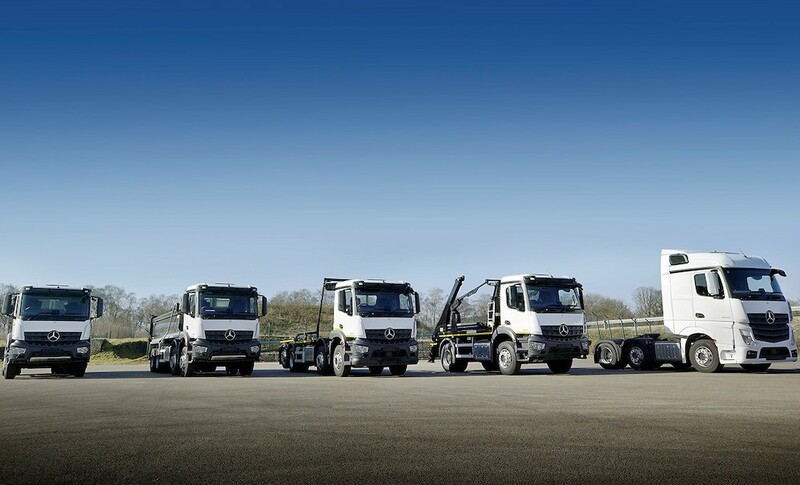 “We ended the year as the second largest truck brand in Europe with a market share of 16.6% in the heavy class. We were the market leader in no fewer than seven countries, produced a record number of 67,000 trucks and were once again the largest import brand in Germany — Europe’s largest truck market. Moreover, DAF has been the undisputed leader in the tractor-unit segment in Europe for many years now,” he said. DAF has been developing and manufacturing its own axles since 1958. Consequently, these axles are perfectly tailored to the many chassis variants that the company offers. DAF axles are characterised by their high level of reliability and durability, low internal friction and low weight — all of which result in low operating costs and high payloads. In addition to the existing 7.5, 8 and 9-tonne front axles, DAF will also be offering a 10-tonne version in the CF and XF from the second half of this year. This is of particular interest for applications in the construction segment, where high front axle loads are commonplace — for example, when a heavy crane is mounted immediately behind the cab. The new 10-tonne front axle features parabolic suspension with three-leaf springs, and minimises the risk of overloading with diminishing loads. The new 10-tonne front axle is available for configurations of the CF and XF which feature a single front axle and are powered by the PACCAR MX-11 or MX-13 engines. DAF is also introducing a brand new 7.5-tonne trailing axle with single wheels. It features a newly designed die cast axle housing, which boasts even greater rigidity and is even more robust than its predecessor, while its weight has been reduced by 10 kilograms. The static load capacity has been increased by no less than 25% to 26 tonnes — an important consideration if the load rests briefly on the rearmost axle during loading and unloading of, for instance, a roll-on-off container. For construction applications, the new 7.5-tonne trailing axle is ideal for use on payload sensitive work and in less arduous applications, such as for container delivery systems and for transporting building materials, where the truck is equipped with a rear-mounted crane. In Germany, this type of trailing axle is also often specified on trucks featuring BDF swap body systems, which are prevalent in the country. The new trailing axle is also used on FTR tractor unit variant of the CF and XF — a configuration ideally suited to, for example, low-loader work above 44 tonnes. 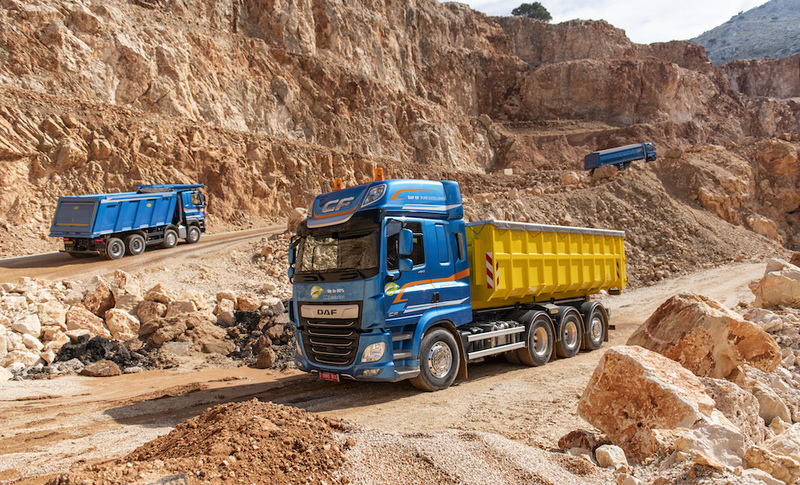 For 6×4 and 8×4 CF and XF trucks that are regularly driven off-road or that require additional traction, DAF offers a choice of double-driven, low-maintenance tandems. The first is the SR1132T, a 19-tonne tandem with single reduction, leaf spring suspension and disc or drum brakes. This tandem is ideally suited for payload sensitive applications such as lightweight 6×4 and 8×4 concrete mixers, and is particularly popular in the UK and Ireland. For heavier applications, DAF offers 21 and 26 tonne variants of the SR1360Tsingle reduction tandem which is equipped with disc brakes and air suspension. This is offered on in three and four-axle tractors and rigids. In addition, DAF also offers 21 and 26-tonne hub reduction tandems with the HR1670T, which can be equipped with air or leaf spring suspension and features drum brakes. This is not only ideal for heavy haulage, but also lends itself to off-road applications. An important factor for the best possible fuel economy is the availability of at least ten rear axle ratio options (from 3.46:1 to 7.21:1 — depending on the tandem). The fastest final drive ratios result in even lower engine speeds for optimum fuel efficiency. For the lowest possible operating costs, the rear axle oil drain interval of the tandems is three years or 450,000 kilometres. In addition to a new series of axles, DAF is also adding a number of new axle configurations to its range. A new configuration within the already extensive range of four-axle trucks with single and double drive is the FAW, which will be available ex-factory later this year. This is a four-axle CF or XF rigid with a tridem, consisting of the SR1360T tandem with single reduction or the HR1670T tandem with hub reduction, and a steered rearmost axle. The new 8×4 FAW chassis has a technical GVW of 37 tonnes and, thanks to the steered trailing axle, can be manoeuvred with great precision. A turning circle of just 7.8 metres makes the 8×4 FAW ideally suited for transporting large or heavy loads to construction sites where there is relatively little space. The new chassis lends itself perfectly as a tipper, concrete mixer, for bodywork with a rear loading crane or for a combination of a loading crane with a hook lift system. Specially designed for heavy work, DAF — in cooperation with Dutch company Estepe — now offers in specific markets such as the Netherlands, a 10×4 CF heavy duty tipper with twin steered 10-tonne front axles, a hydraulically steered 10-tonne pusher axle — which can also be lifted — and the HR1670T tandem with hub reduction and air suspension. The net payload of this ‘special’ variant — which will primarily be used for transporting heavy loads of sand, gravel and stone — is approximately 30 tonnes, with a maximum GVW of 49 tonnes. Despite the number of axles, clever packaging ensures there is still sufficient space for a 350-litre fuel tank. The latest generation of the XF FTM heavy-haulage tractor has not previously been shown to the international trade press. This FTM is an 8×4 tractor with double-drive SR1360T or HR1670T tandem and steered pusher axle, which together form a tridem. The impressive XF is ideal for heavy haulage and exceptional transport applications, where combination weights can add up to 120 tonnes. The use of a single front axle and three rear axles means that the axle capacity can be fully exploited without exceeding legally permitted loads. The chassis of the XF FTM has a wheel base of 4.65 metres and is characterised by the relatively compact construction and a technical GVW of 41 tonnes. This offers significant advantages in terms of manoeuvrability and fifth wheel position, which is important in case of operation with short neck specialist trailers. The XF FTM is a four-axle tractor that comes in various variants. The first has an 8-tonne front axle, an 8-tonne pusher axle and the 21-tonne HR1670T tandem with hub reduction, ideal for a GVW of 34 tonnes. The second has a 9 front axle, 8-tonne pusher axle and 26-tonne tandem axles with hub reduction. The net maximum fifth wheel load for both variants is approx. 24 tonnes. The FAX is an 8×2 rigid with two steered front axles (8 or 9 tonnes) and a steered trailing rear axle (7.5 tonnes) behind the driven axle. This version is already available as a CF and can now also be ordered as an XF. Just as with the comparable CF, the XF FAX offers GVWs of up to 37 tonnes. Its steered trailing axle ensures maximum manoeuvrability, which is ideal when distributing building materials and for example in case a crane is mounted behind the cab. 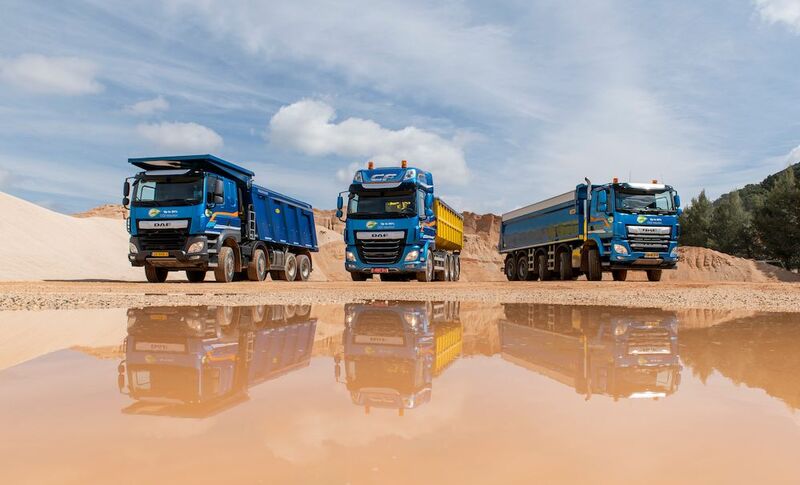 DAF will continue to offer Construction variants of the LF and CF, especially for trucks that are regularly driven off-road. They feature a specifically designed bumper and grille, a 25° approach angle and a generous ground clearance of 32 (LF) or 40 (CF) centimetres, to suit operation across uneven terrain. In addition, all DAF Construction models are equipped with a 3-millimetre-thick steel plate to protect the radiator. A special step behind the door and a railing on the roof on the CF Construction make it quick and easy to check the load. The CF Construction is available as a 6×4 FTT tractor and 6×4 FAT and 8×4 FAD rigids, both with double-drive tandem and the latter with two steered front axles. The CF Construction versions are equipped with a special off-road mode of the TraXon transmission as standard, for optimum shifting performance on challenging terrain. Gear changes are extremely fast and made at high engine speeds to ensure maximum traction in heavy terrain. The LF Construction is available with a 19-tonne chassis. It goes without saying that the LF Construction offers the same benefits as all LF models: for example, a high payload thanks to the low kerb weight, excellent manoeuvrability, excellent all round visibility, enhanced by the the optional window in the co-driver’s side door, a low entry, and high fuel efficiency. Maximum torque at low speed: the particular qualities of the latest generation of PACCAR drivelines really come into their own for applications within the construction industry. The maximum torque of the robust 10.8-litre PACCAR MX-11 and 12.9-litre PACCAR MX-13 engines in the DAF CF and XF (with ratings of 220 kW/299 hp to 390 kW/530 hp) peaks at engine speeds below 1,000 rpm. In combination with the latest generation of TraXon automated 12 and 16-speed gearboxes, this guarantees excellent performance in all circumstances. Recognising operator preference in certain sectors such as construction and heavy haulage, DAF also offers a 16 speed manual gearbox option in combination with PACCAR MX-11 and MX-13 engines. The DAF CF is also available with the 6.7-litre PACCAR PX-7 engine with ratings of between 172 kW/234 hp and 239 kW/325 hp. Vehicles in the LF series are driven by the powerful four-cylinder, 3.9-litre PACCAR PX-4, 4.5-litre PACCAR PX-5, and the six-cylinder, 6.7-litre PACCAR PX-7 engines, with ratings of 115 kW/156 hp to 239 kW/325 hp. The extensive range of gearboxes is impressive: with 5, 6, 9 or 12-speed, manual, automated or fully automatic options, the optimum driveline can be specified for all purposes. A wide choice of power take offs (PTOs) for driving tippers, mixers and cranes is extremely important for the construction segment. DAF offers an engine PTO positioned at 1 o’clock on both the MX-11 and the MX-13 engines. This is available with a direct pump mounting or with a flange drive, offering continuous torque of 800 Nm and a peak torque of 1,000 Nm and is ideal for use in applications, such as concrete mixers and on waste collection vehicles. On the PACCAR MX-11, DAF also offers an 11 o’clock version for direct pump mounting. This is also driven directly from the engine and has a maximum continuous torque capacity of 250 Nm and a peak torque of 400 Nm. This PTO is ideally suited for light applications such as extending crane legs and for tipping systems. There is also a wide range of gearbox PTOs available for delivering power to tipping systems, compressors and cranes. In addition, an indirect PTO with a pump connection can be mounted at the front of the engine. This lightweight PTO has a rating of 20 kW or 35 kW and is ideally suited to driving a hook loading system or tipper. For optimum bodybuilder-friendliness, DAF offers a range of body attachment modules (BAM) ex-factory. This enables the bodybuilder to install a heavy loading crane, tipper or container delivery system quickly and efficiently. An extensive grid of holes in the rear overhang of the chassis enables rapid installation of tail lifts, cranes, a drawbar cross member or rear underrun protection. Quick and easy mounting reduces cost and ensures quick entry into service. In addition, DAF provides plenty of options for controlling the bodywork and equipment from the cab — and vice versa. For example, parameters such as the engine speed can be controlled from the bodywork, either by analogue means or via the CAN bus. Construction operators rely on their vehicles offering the greatest possible uptime as much as in any other industry sector. DAF has therefore developed specific services such as DAF MultiSupport repair and maintenance contracts for construction vehicles. A new addition to the range is an advanced ‘Uptime package’. Operators who opt for this enhanced package receive a discount of up to 5%* on their total MultiSupport contract (on the specific vehicle). Vehicles with the Uptime package have guaranteed availability. That means that a truck experiencing technical problems will be back on the road within eight hours or, if that is not the case, financial compensation of 300 Euro per day** will be offered for every day for which it is unavailable. DAF is also offering additional services, specifically for the construction sector. The DAF Academy has developed special driver training courses, which instruct drivers on how to drive as economically and efficiently as possible, with special attention given to the truck’s off-road functions. 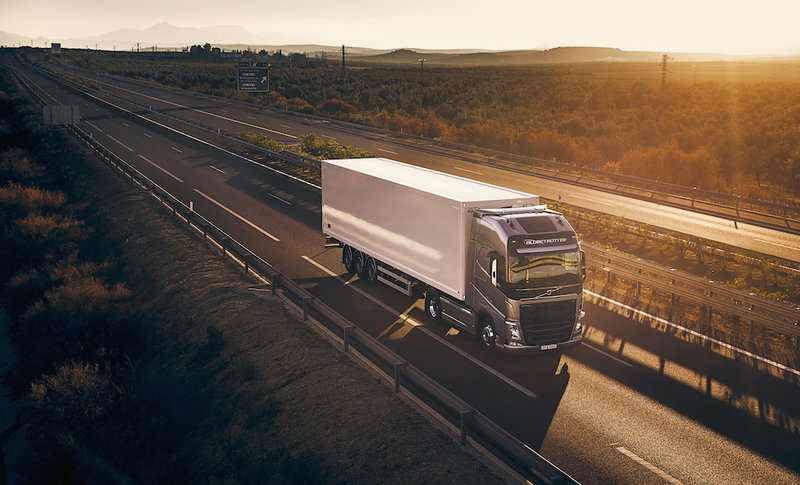 The driver is given extensive instruction upon delivery of the truck as standard, with a particular focus on the functions that are specific to the construction vehicle. The DAF Connect vehicle management system enables carriers to monitor the performance of their fleets online at any time to ensure maximum efficiency. This allows maintenance work to be scheduled proactively. A further useful feature for operators in the construction segment is that they always have an accurate overview of how the truck and the bodywork and equipment (via the PTO hours) are being used. This can help reduce costs and increase uptime. DAF Transport Efficiency also means the best possible availability of components by PACCAR Parts, which not only supplies original DAF parts and PACCAR engine parts through DAF dealers, but also offers an unrivalled range of universal parts for trucks, (semi-)trailers and superstructures, through the TRP All Makes range. In the area of hydraulic systems alone, TRP already covers around 1,000 different systems that can be found on construction vehicles.